When I first saw the email that Project Pabst would be moved inside due to inclement weather, I was worried. Last time I was at the Electric Factory, the place was packed like sardines and I was forced to watch the artist from the concession stand. Certainly the same could be expected for this lineup: hometown heroes Beach Slang and Hop Along, critical darlings Mac DeMarco and Animal Collective, and the ditch-your-job-and-start-a-band legend, Robert Pollard as Guided by Voices. I was surprised when I arrived to a half full Electric Factory with a parking lot converted into an outside bar and arcade with tents to stop the dreary weather. The rain didn’t seem impede anybody’s game of Contra or conversation over a city wide, but it certainly affected the number of festival attendees. I shrugged it off and headed into the venue, knowing I’d be closer to the stage because of it. The band opened with a choice selection of their signature Replacements-inspired sound, and as the song finishes lead singer James Alex lets the crowd know, “We are Beach Slang, and we came to punch you right in the heart.” The set was full of energy and old-school-rock swagger, with Alex pulling Townshend windmills and letting out screams at every opportunity given. As usual, frontman Alex is the star of the show, bringing back some energy to what appears to be a crowd either down on the weather or tired from drinking for three hours. Never strangers to a cover song, Beach Slang decided to break out the Cure classic “Just Like Heaven” towards the end of the set. It struck a balance between the original and Dinosaur Jr.’s scream laden version, a sweet spot I never knew I needed to hear. At the sets conclusion, I was left so enamored and impressed by Alex’s performance; I barely noticed the man on stage who was closest to me, lead guitarist Ruben Gallego. On Tuesday of the following week, news broke that Gallego had been kicked out of the band due to accusations of sexual assault. Gallego has been on the record agreeing with Alex and company’s decision for the dismissal. It remains a stunning reminder to me that the realities of privilege are often hiding in plain sight. Following Beach Slang were Guided By Voices. Every band that graced the stage from Beach Slang on acknowledged the influence of Pollard’s band, and their fanbase remains relatively niche but exuberantly passionate. I’m a casual fan, which means I knew a small portion of the material throughout the 22-song, one hour set. As for the fans who could sing every word, they seemed to gravitate towards the center of the floor until their excitement could not be contained; their love for Pollard’s prolific output was made known by the swarm of bald spots and 20-somethings that began moshing in the center of the crowd. They hung on to Pollards every movement and word, shouting cheers when he opened a beer from a cooler he brought on stage or spilling their own drink at the the announcement of an ESP Ohio cover. 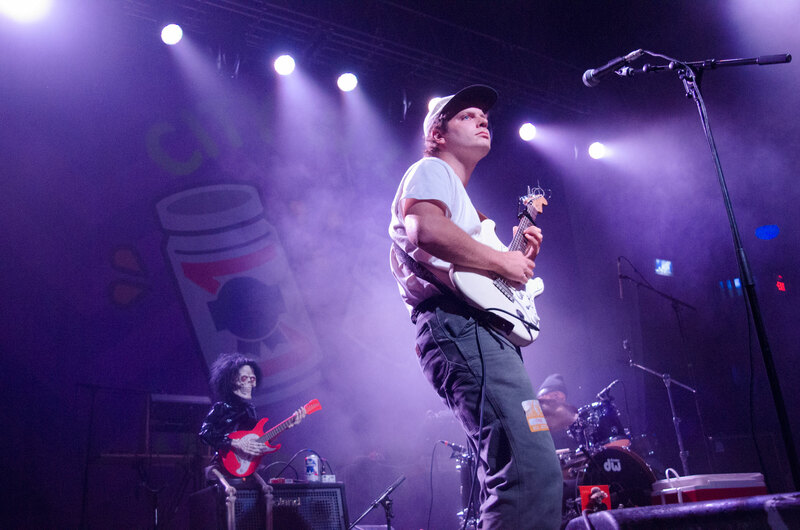 It was the greatest excitement of the day, culminating in dads crowd surfing during “The Goldheart Mountaintop Queen Directory.” At the set’s conclusion an exodus of fans skewed the mean age by 10 years, and I found my way to the front for Mac DeMarco. Mac DeMarco and his band are goofy, there is no getting around that. When they first take the stage each man carries a animated plastic skeleton and places it on an amp or next to the speaker. During an elongated soundcheck, DeMarco and fellow guitarist Andy White trade mic-check phrases to see who can make the crowd laugh more. It’s a needed distraction for the 15-plus minutes spent perfecting instrument levels, the final few of which left the crowd unruly. Fortunately, any sentiment of ill-will towards the sound mixers quickly vanished once the band started into their first song, “The Way You’d Love Her.” DeMarco is certainly one that understands the impact of audience interaction. Should you bring a hat to the show and throw it on stage DeMarco is sure to put it on for a song or two. The tight set time coupled with soundcheck left no room for derivation from the setlist, but the band still managed to answer questions and pack in an extended closer in crowd favorite “Still Together,” complete with stage dive and a guitar solo that lasted as long as any song they played prior. Though some ardent DeMarco fans surrounding me seemed miffed by the short set, I found it a perfect primer for the final two acts. It served as a powerful opener; Quinlan’s unique voice rang through the venue, each slight imperfection and scream hanging in air, converting any skeptics in the crowd to outright fans. From there the rest of the band joined in for yet another set that had to be shortened by stage times. Quinlan crafts stories in her lyrics, which differed from the previous acts who could be described as equal parts celebrating and critiquing guitar-rock cliches. This, combined with Quinlan’s croon weighing heavy in the mix, produced an attentive crowd that slowly gave into the tunes’ groove. That is to say nothing of the band, which played like a well oiled machine. Quinlan’s brother Mark and bassist Tyler Long never miss a beat in the rhythm section, while Quinlan and lead guitarist Joe Reinhart follow in the stylistic footsteps of tourmate Doug Martsch. The band knows these songs well, even when they do a menacing cover of the Weeknd’s 2015 hit “The Hills.” It all makes for what I considered the best set of the day. If you have not had the chance to see Hop Along yet, you should take advantage of them being back in city. Local shows are bound to pop up in the coming months, and they will certainly be worth it. The day’s closing act was both the festival’s largest draw and strangest act, Animal Collective. The stage, which had been bare bones for the entirety of the day, began to fill with stage props: new backdrop, a cubist statue, two-dimensional eyeballs hanging from the rafters. Gone were the guitars that had ruled the day. In their place stood three electronic rigs with drum machines and synths galore. The only traditional instrument that survived the switch over was the drum kit. Animal Collective brings in the largest crowd of the night, and from the first song it became clear that the fans came to dance. The songs merged together as the Baltimore group seamlessly transitioned from new material to tunes from their most revered album, “Merriweather Post Pavilion.” The crowd erupted in a drunken pleasure, one that this writer was too sober to partake in. As with all festivals, the time eventually came when the need to witness the band was outweighed by the need to return home. About halfway through the set the witching hour came, and I took an Uber ride home. For an inaugural edition met with less than ideal weather, I must say Project Pabst Citywide Festival was a success. The bands were carefully picked for a diverse mix of local talent and established acts, and I will definitely be returning next year should the caliber of the lineup remain.